The Mozee holster for the new Verifone e285. After the launch and success of our holster for the e355, we began to look at ways we could additionally support the next Verifone mPOS device. Handeholder Products, Inc., an industry leader in tablet and mobile payment device holding solutions, announces the release of the latest product in their successful Mozee holster line – a holder for the new Verifone e285 mPOS device (http://www.handeholder.com/mozee_e285_holster.html). It will be unveiled at the Handeholder Products exhibit booth, #2635, at the Annual HITEC Conference running June 18th to the 21st in Houston, Texas. Ideal for the retail, healthcare, hospitality and restaurant industries, each simple and versatile product in the Mozee holster line is designed to take the most advantage of the integrated belt clip. Whether used as a wearable on a belt, around the neck with a lanyard, or mounted to a tablet, phone, or other hard surface by clipping into the included Universal Mozee Mount (http://www.handeholder.com/Mozee_accessories.html), this single accessory can serve multiple mobility functions for the e285. This latest product joins the previously introduced mobile-payment-device holsters for the Ingenico Group’s iSMP4, the Verifone e355/e265, and the Miura Systems M010. The Mozee e285 holster is available for pre-order now at http://www.handeholder.com/mozee_e285_holster.html. Pricing starts at $19.99 for a single package of one holster and one mount piece. The following bundles are also available; a 5-unit Small Business Bundle, 10-unit Medium Business Bundle, and 25-unit Enterprise Bundle. Additional individual Universal Mozee Mounts are priced at $2.00 and have the same bundle options. 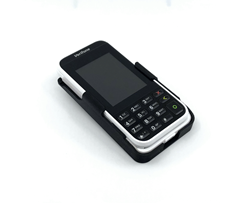 For more information on all the Mozee lines of mPOS mobility solutions currently offered by Handeholder Products, please visit http://handeholder.com/mozee.html.